The SunTrust Foundation presents a $1 million grant to Boys & Girls Clubs of America to support workforce readiness in a ceremony on Friday, March 15, 2019. Pictured left to right: Stan Little, president, SunTrust Foundation; Jim Clark, president & CEO, Boys & Girls Clubs of America; Major Bob Parker, The Salvation Army Metro Atlanta Command; and Joshua Dickerson, executive director, The Salvation Army Boys & Girls Clubs of Greater Atlanta. ATLANTA, March 18, 2019 /3BL Media/ — Boys & Girls Clubs of America announced today that the SunTrust Foundation has committed $1 million to Boys & Girls Clubs of America’s Workforce Development Effectiveness Project to help put youth in up to 45 Clubs across the Southeast on the path toward financial well-being. 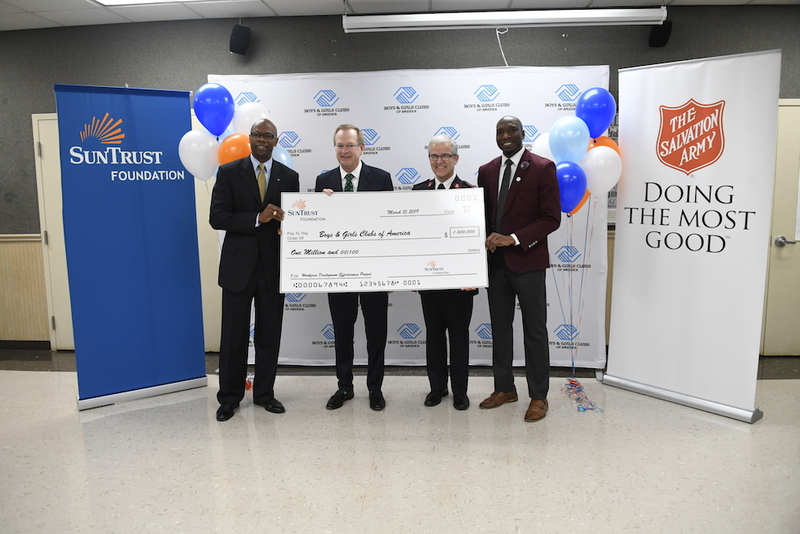 Stan Little, SunTrust Foundation president, presented Jim Clark, president and CEO of Boys & Girls Clubs of America, with the donation at a special event on Friday, March 15, at The Salvation Army Bellwood Boys & Girls Club in Atlanta. Globally, employers are faced with a talent shortage. In particular, U.S. employers say that the inability to find qualified workers is their biggest obstacle to growth, with many indicating their greatest needs are in the area of soft skills (e.g., communication, customer service, creativity, collaboration and critical thinking). A new initiative from Boys & Girls Clubs of America, the Workforce Development Effectiveness Project, was created to provide youth with the knowledge, skills and experiences to better prepare them for the workforce, thus improving their socioeconomic potential over their lifetime. The SunTrust Foundation is committed to SunTrust Bank’s (NYSE: STI) purpose of Lighting the Way to Financial Well-Being by engaging with local and national organizations to advance financial confidence. Grants and activities focus primarily on financial education, financial counseling, career readiness and small business/entrepreneurship, in addition to local community grants. The SunTrust Foundation supports American Red Cross disaster relief efforts and contributes as a United Way Global Corporate Leader. Established in 2008, the SunTrust Foundation has proudly provided grants totaling more than $160 million throughout the United States.